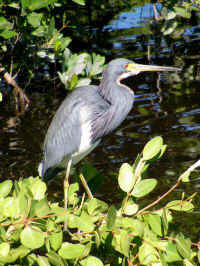 The Tricolored Heron is one of the most beautiful of the wading birds, particularly in its mating plumage. Generally identified by its white underbelly area, its coloration can cause confusion with the much larger great blue heron or the slightly smaller little blue heron. 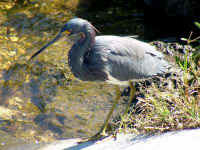 Part of the uncertainty may result from the differing hunting techniques it has developed; it will stealthily stalk, motionlessly waiting for an opportunity to strike its prey along the shoreline and it will also chase wildly through the flats in pursuit of a good meal. 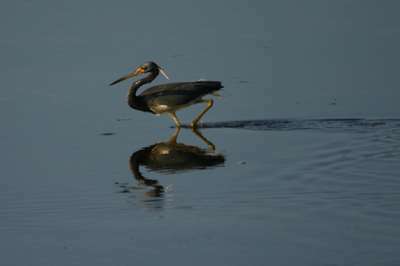 The tricolored heron has several colorations: a striking upper-blue version (L) and a grayish-blue (upper M & R) that is more commonly seen. The reddish colorations pictured above may indicate adolescent birds. 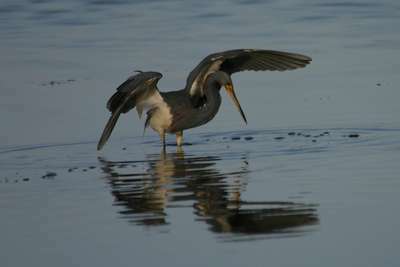 Picture sequence shows a tricolored heron moving rapidly through the water and opening wings. 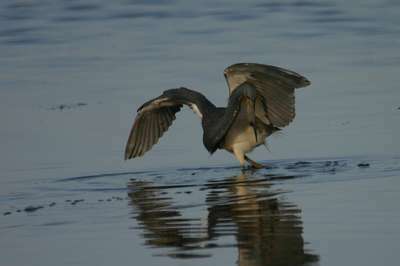 It is not known if the extended wings provide shade to lure fish or allow better underwater views for the heron. Tricolored heron reddish-brown back plumes (L) and white underbelly (R). The Tricolored-Heron has striking breeding plumage including a blue bill with black tip, wine-colored legs/feet and deeper coloration of buff-colored plumes on its back. 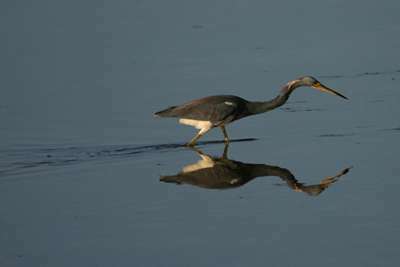 Although a patient hunter with stealthy skills at the water's edge (shown in pictures above), the tricolored heron will also move rapidly, run and use its wings, similar to the reddish egret, when fishing in shallow off-shore waters (pictures below). 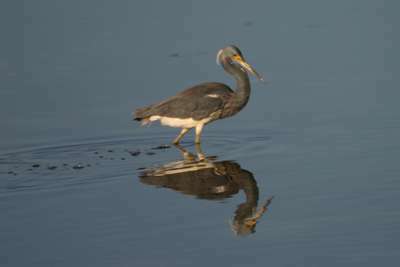 Tricolored Heron portrait in breeding plumage.